Due to the possibility of heavy rain tomorrow, Saturday Oct 24, Savio is postponing the Fine Arts Carnival .... it has been rescheduled for Saturday, November 7th. Have a safe week-end and we look forward to the Carnival on November 7th. Come one, come all...The Savio Carnival is still on - Rain or Shine! 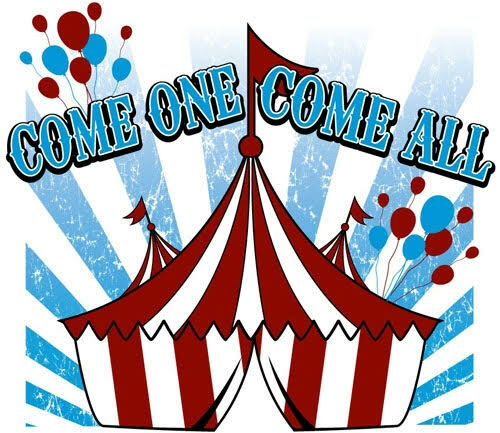 Due to inclement weather, the Savio Carnival will be held inside the school in the gym and commons areas. Join us for Rainy Day Fun for the whole family, Saturday Oct. 24th from 10am-2pm. Game booths for all ages, moonwalks, cake wheel, karaoke and so much more! Throw your friends in our carnival "Jail"! Soak your teacher in our "Soak-n-Wet" booth! Test your luck in our Mystery Gift Card guessing game! Come hungry! Have lunch in our carnival food court... Pizza, Hot Dogs, Bush's Chicken, Cotton Candy, Popcorn, Ice Cream and an assortment of snacks are on the menu. On Saturday, October 17th, Savio sent two teams to Trinity University for the fifth annual Alamo City Quiz Bowl tournament. Senior Patrick Lahey and juniors Eleazar Camez, Nick Isakson, and Daniel Jilek made up the Savio Blue team. 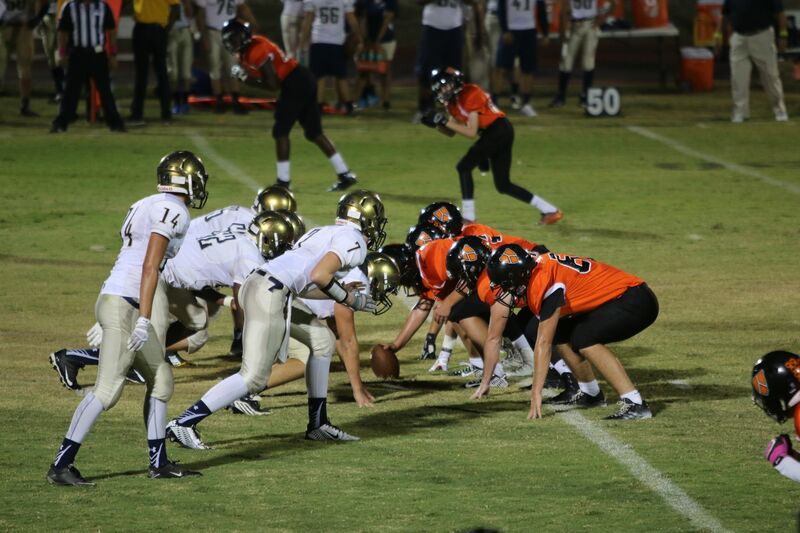 Junior Jack Frey and freshmen Nicholas Huth, Matthew Meskill, and Jonathan Shoemaker filled the roster for Savio Gold. A total of 28 teams competed in the event. The Gold team got a very unlucky preliminary round draw. They faced LASA B (who finished first in the tournament), Reagan Black (3rd place), Clark White (5th place) and Keystone A (6th place). The Gold team lost each of these matches, as well as one to the St. Stephen's B team. But they did manage to notch a victory over Gregory-Portland. With a 1-5 record, the Gold was seeded #22 for the playoff round. In the first playoff match they handily defeated the #23 seed from Juan Diego Academy by a score of 180-75. In the second playoff match they stunned the #7 seed St. Stephen's B. They avenged the preliminary round loss by a score of 275-105. The Eagle Gold had the lead shortly before the midway point of their next match, but in the second half the #10 seed from Brandeis High School pulled away to end the Eagles' day. The Eagle Gold finished in 14th place overall. The leading scorer was Matthew Meskill with 33.3 points per game (5 powers and 5 NEG5's). The Savio Blue team completed the preliminary round with a 4-2 record. They gave the eventual tournament champion LASA B team a run for their money. The score was tied at toss-up #17, before LASA B pulled away in the final four rounds of the match to win by a score of 315-250. The other loss was a heart-breaker to Keystone A. The Eagles held a big lead early, but Keystone fought back to take the lead late. The Eagles could have won on the final tossup, but they negged the Keystone team prevailed 265-220.
team with 60 points per game (22 powers and 8 NEG5's) and was the #6 overall scorer in the tournament. 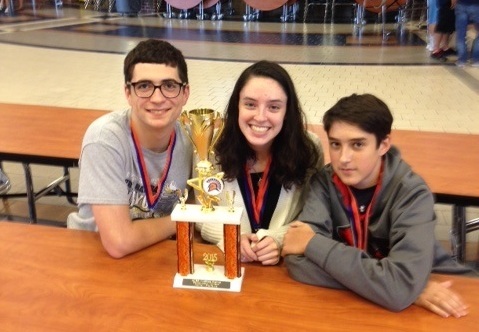 Savio Quiz Bowl will next compete in the Bronco Bowl at Brandeis High School in San Antonio on November 14th. New players are always welcome on the team. E-mail Coach John Isakson at jisakson@earthlink.net if you are interested in joining. Eagle Golf Classic Big Success! Thank you to the 75 golfers that came out on the beautiful Monday morning to support St. Dominic Savio Athletics. Great Fun was had by all! 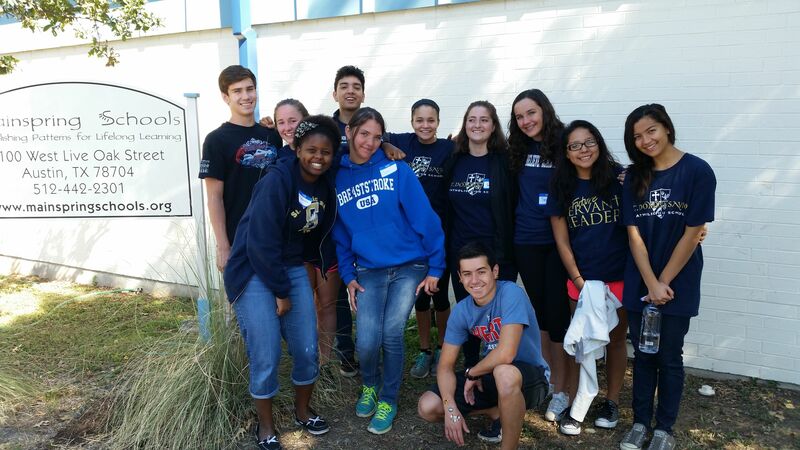 The Savio Swim Team went to Mainspring School as part of their team service project this past Monday. Since 1941, Mainspring has been a best-in-class nonprofit pre-school that eliminates the early childhood school readiness gap. Their mission is to deliver the highest quality early education and care to Austin’s most economically disadvantaged children – along with services so each child and parent have tools for success in school & life. The team spent several hours assisting with the needs of the kids and helping in the classroom. The St. Dominic Savio Computer Science Team entered their first tournament this weekend at Seven Lakes High School in Katy, Texas. Over 300 students attended the competition. Savio was entered in the Novice Division for teams with one or less years of computer science class experience. A total of 53 teams were entered in this division. The competition consisted of two parts. All 159 students took a written exam covering a variety of topics, and then each team of three had 2 hours to solve 18 problems using a single computer running Java. The top 6 teams were awarded trophies while 7-12 were awarded ribbons. When the dust settled, the team of Matthew Bianchi, Emily Shoemaker, and Jonathan Shoemaker had finished in 5th place, one problem away from 2nd place, and two problems from winning the whole thing. In addition, the team won individual awards for placing highly in the written contest (Jonathan – 6th, Emily -8th, Matthew 13th). The fifth place showing earned Savio its first computer science trophy for the trophy case. 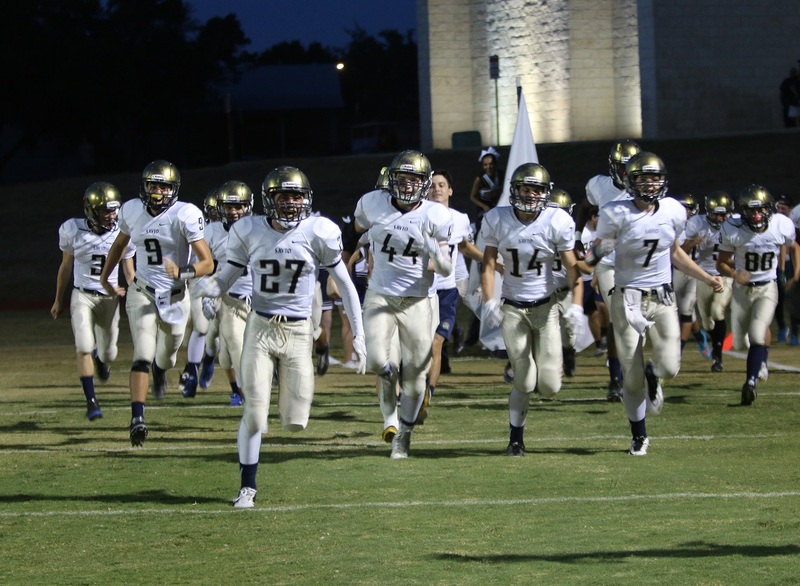 The St. Dominic Savio Eagle football team broke it's five game losing skid on Friday beating host TMI 14-7 in San Antonio. The Eagles were led on offense by senior running back George Miksch who rushed for over 100 yards and one touchdown, while sophomore linebacker Brandon White led the Eagle charge on defense. Coach Gutilla was pleased with his team's effort. "I'm very happy for the team. They fought hard tonight for this (win). TMI played well, but our kids showed the kind of resilience we (the coaches) knew they've had in them all along. When the going got tough we got going." This week is a bye week for Savio, but the Eagles will have an unexpected two week layoff after finding out that East Austin Prep declined to play on October 23rd. Coach Gutilla calls it "a blessing in disguise" as he and the coaches believe that the two weeks off will provide the needed rest, and healing time for the injured to get ready for their next game at home (at McNeil HS) on October 30th against San Marcos Academy. 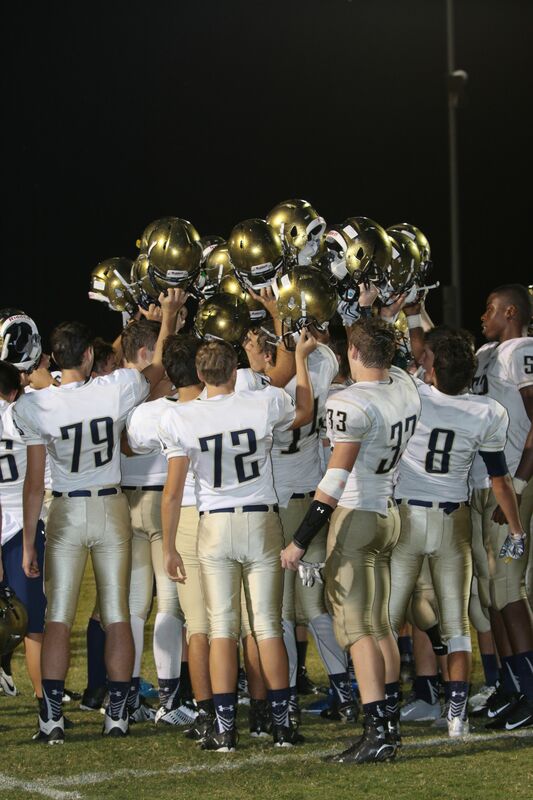 Playing for the first time in one of the premier high school football stadiums in Texas, and in front of an enthusiastic homecoming crowd, St. Dominic Savio couldn't overcome early mistakes and fell to the undefeated Hyde Park Panthers 30-7. Coach Joe Gutilla's Eagles again dug themselves a deep hole early. Coach Gutilla said, "We just continually find ways to self-destruct, and against really good teams they will capitalize on those mistakes." However, coach was pleased with the effort of the team in the second half. Down 30-0 at half the Eagles made a defensive adjustment and did not allow Hyde Park to score in the second half. This Friday Savio will make a return trip down I-35 to San Antonio to take on TMI.